Most people agree that for something to be a sport, it must be both athletic and competitive. I’m not sure parallel parking qualifies, but if solo synchronized swimming can make it to the Olympics, competitive parking can too. If that ever happens, a Chinese stunt driver named Han Yue has a great shot to win the gold. 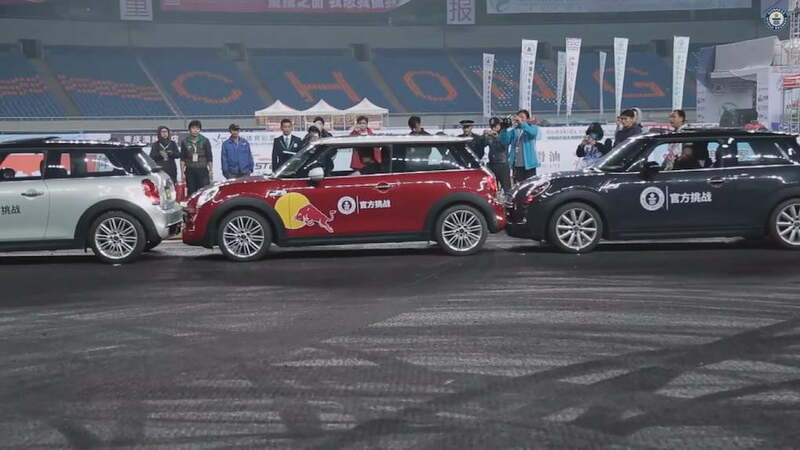 At the 2014 China Drift Championship held in Chongqing, Yue slid into the history books by parallel parking a MINI 3-door Hatch between two others just like it. When it was all said and done, there were only 3.15 inches of room in total to spare. A video of the feat has been posted by Guinness World Records, which includes Yue’s test run before the final attempt. To break the record, Yue races toward the opening at a comfortable speed, then engages the emergency brake, whipping the MINI into place without a scratch. After the dust settled, not even the tape used to measure the gap would fit between the MINIs. Afterward, Yue’s team materialized around him to throw him in the air, which was probably the most athletic thing to happen all day. From the looks of his jumpsuit, Yue is sponsored by Red Bull, who will hopefully provide the wings it’ll take to get out of that spot. The previous record was an impressive 3.38 inches, set last year by an Englishman named Alistair Moffat. Moffat was more accurate than the 2012 measure of 5.9 inches, set by none other than Han Yue himself. His technique is undeniably impressive, but amateur motorists take note: this type of maneuver will probably put an end to your driver’s test pretty quick.